[product design features] ◎ table cloth - all made of easy to clean, easy to dry cotton / ancient cloth / section gauze sewing. ※ In order to get the best area, the drawing will not necessarily be the same when the cloth is cut. If you mind, please buy it carefully! ◎ Opening - (1). Double buckle: The beveled opening is convenient for hand to eat, the buckle is not afraid of washing and rusting, and it is more convenient to use. (2). Single deduction: open on the front side, there is a buckle in the middle, the coating is better, can be directly carried. ◎Neri - no bleaching and dyeing original embryo cotton fabric, easy to clean and easy to dry! 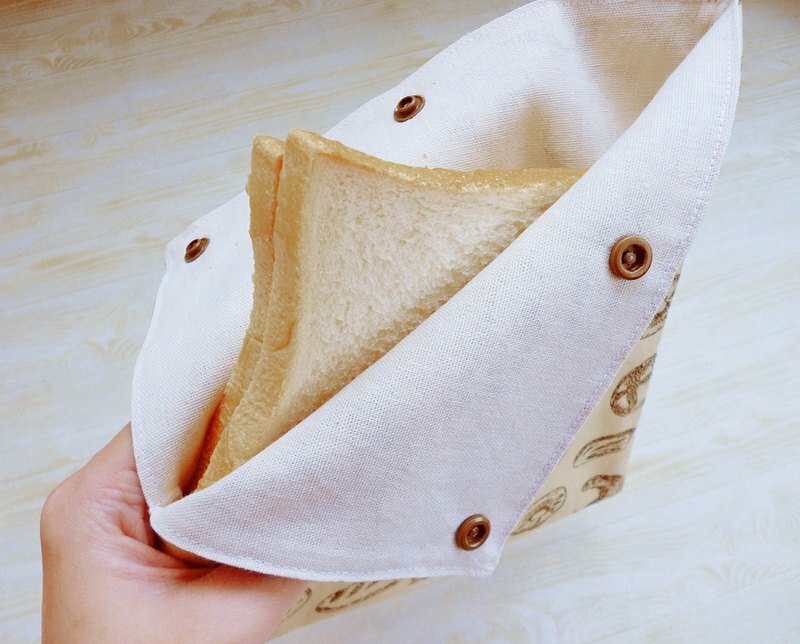 ◎ cotton cloth can absorb a small amount of oil and water, can put toast, bread, sandwiches, chicken cakes, dry food... and other dry food without soup. I hope that everyone can make every effort to be environmentally friendly and healthy. [Material and Washing] ◎ Japanese cotton cloth ◎ It can be gently hand-washed with neutral lotion or household soap, and can be ironed. 【size】 Flat quantity: the bag body diameter is about 19cm (error is about 1~2cm) [Flower rabbit hand made the original intention and small 叮咛] ◎ Hand works and the transmission of love is the original intention of the flower hand rabbit to start selling hand works. ◎The sales income is used in the rabbits to feed and rescue the waves. ◎I wish to make the world a better place with the power of small bean sprouts~ ◎Hand sewing with one stitch and one thread may have some imperfections. ◎Everyone has different screen settings, so the actual product and the screen display may have a slight color difference. ◎Handmade, perfectionist for color and work, please think twice before buying. ◎On Saturdays and Sundays, the family day and materials procurement will be processed for one day, and will not be shipped (except for special orders). ◎ Part-time non-exempt orders, if there is a specified time limit arrival date, please confirm the order before the order, do not place the order directly, can not be allocated a reasonable meeting. ◎ Non-24 hours online, please contact us if you have any questions, wait patiently, and you will reply and deal with it in the first time!